Petroleum Versus Petroleum: This strange stuff they're bringing up out of the ground in Placerita Canyon isn't your daddy's aslphalt-based petroleum. So declares the December 1900 edition of "The Land of Sunshine," a magazine edited by no less a writer than Charles F. Lummis, famous chronicler of turn-of-the-20th-century Los Angeles. In August of that year, the New Century Oil Co. brought in the second promising "white oil" well, predated only by Freeman & Nelson's discovery well the year before. Lummis' magazine story indicates the owners of New Century No. 1 sent samples to J.M. 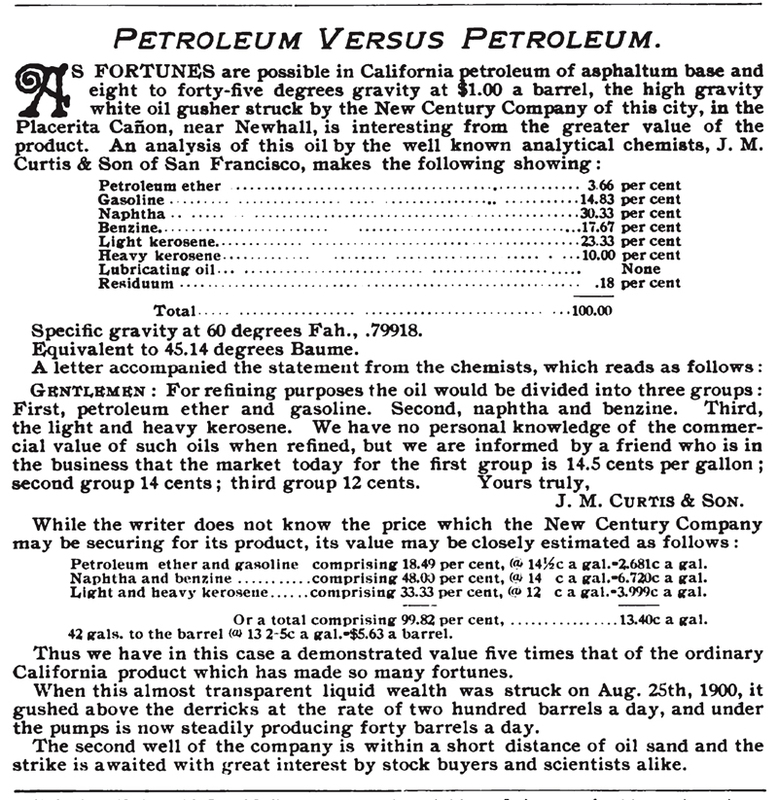 Curtis & Son of San Francisco for chemical analysis, and that it was found to be 99.82 percent usable product with little or no refining  with just 0.18 residuum (heavier oils that are costly to refine). Lummis' story also gives us the date the New Century Well No. 1 came in  Aug. 25, 1900  and tells us it gushed at 200 barrels per day (another source says 100 barrels), leveling off to 40 barrels per day by the magazine's December publication date. Subsequent sources suggest the flow continued to slow. Special thanks to local historian Stan Walker (no relation to Placerita property owner Frank Walker) for directing us to this source. LW2257c: 9600 dpi jpeg from .pdf copy of magazine cited.